1) All kinds of notebooks, double-ring notebook, hardboard notebook, vinyl jacket notebook,etc. Design the cover and inner sheet according to custom requirement. Machining the cover according to custom size print the Logo, the ways include primary color emboss, gold or silver stamping, silk-screen, etc. Print the inner sheet the inner sheet can be color printing, can print anything. Assembling the inner sheet and cover. Packing per unit, and packing into carton.Usually the gross weight is less than 16 kg. The carton size design according to different products. If you want to make custom notebooks with your logo,slogan,telephone,website,email , please send us your design or give us instructions about your imprint.We'll send a free virtual art proof for your approval,you can ask a real sample with logo before production too. 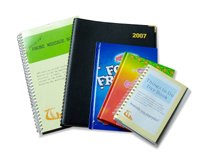 Our notebooks is popular as promotional,advertising, business,corporate gifts.